To find out about our upcoming events, and be the first to book, please sign up to our newsletter. We hold special events in the restaurant throughout the year. The most popular is our Thanksgiving Feast – which is becoming somewhat legendary. People start looking to book for the coming year from, well, from the day after the event. For the record, we don’t start the booking until October and we celebrate on the Thursday, Friday and Saturday evening – sign up for the newsletter and you’ll be the first to know. It’s always a really fun evening – a buffet style serving of Turkey dinner with at least ten sides, as many seconds as you wish – then apple, pecan or pumpkin pie. We also keep you well hydrated with wines, cocktails and soft drinks. Have a look at last year’s menu. July 4th is another big celebration for us – we turn to the classics we remember from childhood BBQs. 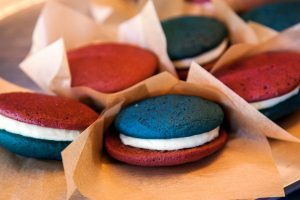 Ribs, dogs, burgers, lobster rolls and fried pies – it’s a great party across the weekend and onto the day itself. Have a look at last year’s menu. 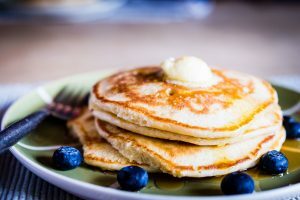 Pancake Day is a deliciously decadent day dedicated to one of our favourite food types. We have a special menu all day in store and for delivery. 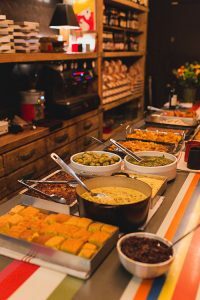 We also host special evenings throughout the year – focussing on food and wine from a particular State, cocktail heritage across the USA or celebrating the diversity of the community.